Fernando Iazzetta is a Brazilian composer and performer. 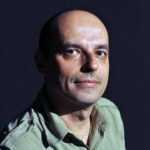 He teaches music technology and electroacoustic composition at the University of São Paulo and is the director of NuSom – Research Centre on Sonology at the same university. His works have been presented in concerts and music festivals in Brazil and abroad. As a researcher he has been interested in the investigation of experimental forms of music and sound art. He also runs a record label and studio – the LAMI – at the University of São Paulo. 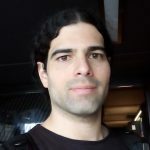 He currently is a research fellow at CNPq, the Brazilian National Council of Scientific and Technological Development. 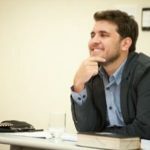 Since 2010 he is the consultant for the Arts Committee at FAPESP – the São Paulo Research Foundation. 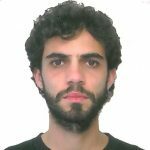 Davi Donato is a researcher with a master’s degree on music from UFRJ, and currently, a PhD candidate at ECA-USP. His interests are experimental music, sound arts, technology, theory, and discourses on listening and sound. He is a member of NuSom and of Rede Sonora. Flora Hoderbaum is a performer, composer and sound researcher. She investigates vocal and instrumental poetics with emphasis in Sound Poetry and its intersections with Experimental and Electroacustic Music. 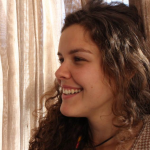 Flora is a PhD student in Music Sonology at USP’s NuSom research group, co-editor of linda magazine by NME/SP collective and also operates within the Sonora – musics and feminisms. Henrique Souza Lima is an artist and researcher. He received his PhD in Arts from the University of São Paulo. His work foregrounds intersections between listening and coloniality, informed by the notions of otography, audiovirology and listening design. Igor Reyner is a graduate of King’s College London, where he obtained his PhD in French Literature in 2017. In 2010 he completed a B.A. degree in Music at UFMG, where he also gainedan M.A. degree in Music with emphasis on sound studies in 2012. His work combines musicology, literary criticism and sound studies with a particular emphasis on the history of listening. Marina Mapurunga is a sound artist, sound editor for films and researcher. 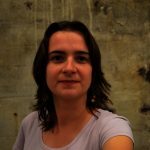 She’s a PhD student in Music/USP and professor at the Cinema course/UFRB, where she started the laboratory of experimentation in Sound- SONatório. 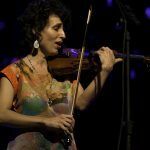 She integrates the NuSom and the Sonora network – Music and Feminisms. Member of the Orquestra Errante. Migue Antar is a musician and researcher. Graduated in music at the Ateneo Paraguayo and at USP. He integrates the groups Ôctôctô, Joaju, DuoCoz, Filarmônica de Pasárgada and KairosPania Cia. Cênico Sonora. 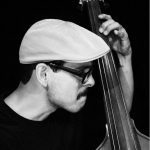 Member of the Orquestra Errante and of the NuSom project – ECA-USP Sonology Research Center. Valéria Bonafé is a composer, researcher and music teacher. She received her academic education – Bachelor, Master and PhD – at the University of São Paulo between 2002-16. 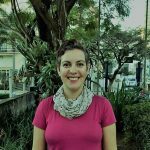 Currently she is a teacher at EMESP – Sao Paulo State School of Music, an associated researcher at NuSom – Research Center on Sonology, and an activist at Sonora – Musics and Feminisms. Yonara Dantas is a actress, director, researcher and teacher. PhD in Psychology at USP. Trained in Arts by Celia Helena. Researcher of the relations between scene and music in the groups Orquestra Errante and NuSom (Núcleo de Pesquisas em Sonologia). Teacher at the Escola Superior de Artes Célia Helena. She directs KairosPania Cia Cênico-Sonora and integrates the Coletivo Quartocê.